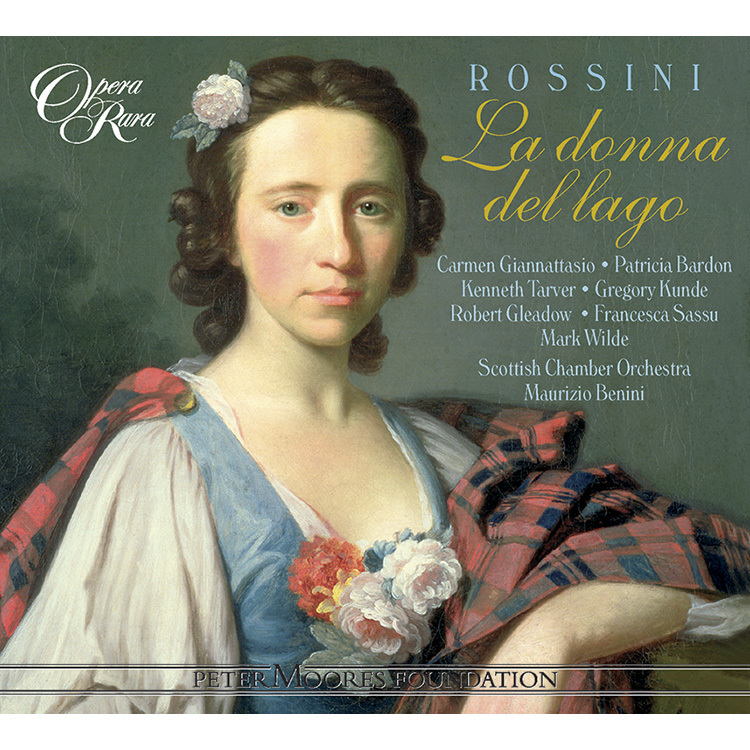 Rossini’s La donna del lago (Naples, 1819) was not only the first Italian opera to be based on a work by Sir Walter Scott, the narrative poem The Lady of the Lake: it was also a milestone in the development of romanticism in Italian opera. 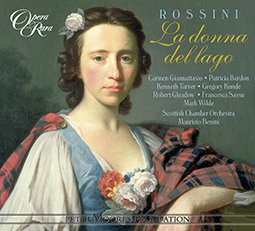 Rossini’s La donna del lago (Naples, 1819) was not only the first Italian opera to be based on a work by Sir Walter Scott, the narrative poem The Lady of the Lake: it was also a milestone in the development of romanticism in Italian opera. Still to this day, we cannot fail to respond when Rossini writes an enchanting aubade for his Elena as, making her first appearance, she rows her skiff across the placid mountain waters of Loch Katrine. Still today, we are stirred as the Scottish chieftain Roderick Dhu gathers his warrior clansmen, and a chorus of bards fires them with courage and daring.The seventh of nine operas which Rossini wrote for the Royal Theatres of Naples, La donna del lago was composed for Isabella Colbran, the Spanish soprano who, in 1822, became his wife; for Giovanni David and Andrea Nozzari, two tenors who, since they were stable members of the San Carlo company throughout these years, became associated for all time with his operas; and for Rosmunda Pisaroni, one of the great mezzo-sopranos of the age who specialised in male travestì roles. 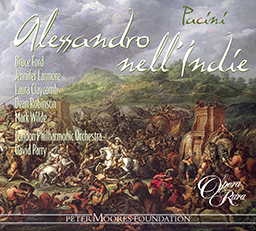 Created by four singers of such extraordinary accomplishment, it is little wonder that this proved one of the most successful of all Rossini’s serious operas. 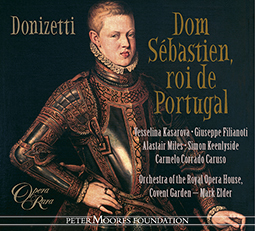 Recorded at the 2006 Edinburgh International Festival, with the Edinburgh Festival Chorus and Scottish Chamber Orchestra, the opera is conducted by Maurizio Benini. 03 La donna del lago : Act I scena II: Duet: Oh mattutini albori! 06 La donna del lago : Act I scena III: Duet: Uberto! ah! dove ti ascondi? Uberto! 07 La donna del lago : Act I scena IV: Duet: E in questo di? 13 La donna del lago : Act I scena VII: Recitative and Cavatina: Mura felici, ove il mio ben si aggira! 14 La donna del lago : Act I scena VII: Recitative and Cavatina: Elena! oh tu, che chiamo! 32 La donna del lago : Act I scena IX: Finale: Su ? amici! guerrieri! 38 La donna del lago : Act II scena II: Trio: Parla ? Chi sei? 41 La donna del lago : Act II scena III: Aria: Douglas! Douglas! ti salva! 42 La donna del lago : Act II scena IV: E tanto asasti? 44 La donna del lago : Act II scena V: Che sento! 47 La donna del lago : Act II scena VI: Ah! che vedo! qual fasto! SCENE 1. An elaborate set shows the Scottish mountain of Benledi, with Loch Katrine nestling in a valley at its foot. As dawn breaks, huntsmen traverse the slopes, and shepherds and shepherdesses set out to their day’s work in the valley. A small skiff appears on the loch: Elena, the Lady of the Lake, is at the oars and sings an aubade in which she greets the dawn but regrets the continuing absence of the man she loves, Malcolm Groeme. As she reaches the shore and disembarks, she is hailed by a huntsman whom we soon identify as Uberto, Knight of Snowdon. Declaring that he has been separated from his companions and has lost his bearings, he asks her help, and she offers him the hospitality of her rustic cabin on an island in the middle of the loch. Uberto, who spontaneously feels amorously drawn towards her, accepts her invitation, steps into her skiff, and accompanies her across the lake. Huntsmen, Uberto’s companions, descend from the cliffs in search of him. They disperse in different directions, agreeing that the first who catches sight of him should signal his discovery to the others. SCENE 2. The island dwelling of Ellen and her father, Douglas d’Angus. A rustic cabin, its walls are decorated with weapons. Douglas, formerly the tutor of King Giacomo V (James V) of Scotland but now out of favour and exiled, has been given shelter here by Rodrigo di Dhu (Roderick Dhu), the formidable chief of the Highlanders. Serano, one of Douglas’s followers, informs Albina, Elena’s attendant, that Rodrigo is expected there that very day. His purpose in coming is to gather his clansmen in resistance to Giacomo, who is endeavouring to bring the Highlands under his centralised control. Albina anticipates the coming of Rodrigo with some concern, since she is aware that Douglas, in gratitude for the hospitality and protection he has received, has promised his host Elena’s hand in marriage. Yet she also knows that Elena, already in love with Malcolm, is unable to reciprocate Rodrigo’s passion. Uberto, ushered in by Elena, is surprised to see the weapons adorning the walls, especially since he is certain that he recognises them as belonging to Douglas, from whom he has been so long estranged. He is clearly ill at ease, and becomes increasingly anxious to depart when Elena confirms that Douglas is her father. Elena’s female companions come to give her their morning greeting, but strike an unwelcome note as they remind her of Rodrigo’s suit: her reaction is one of dismay, while Uberto betrays signs of jealousy. He guesses correctly that she loves someone other than Rodrigo, but, misled by the strength of his own feelings, incorrectly assumes that it is himself. Elena offers him a draught of beer by way of Highland hospitality and accedes to his wish to depart and rejoin his companions. She refuses, however, to allow him to kiss her hand, telling him that no such strange customs are practised in the Highlands. She retires to her apartments, while Albina ferries Uberto back to shore. The stage is no sooner empty than Malcolm appears, returning after an absence of several months. His happiness is qualified by fear that Elena may yet be snatched from him, and he is relieved when, standing aside to witness the manner in which she greets her father, who also returns at this moment, he notes that she tries to prevaricate and deflect any talk of marriage by saying that the unsettled times render such ideas untimely. Douglas, unaccustomed to have his wishes thwarted, sternly rebukes her, but then, hearing a distant fanfare of trumpets, goes to welcome Rodrigo. Malcolm comes forward to embrace Elena, and together they renew their declarations of love and loyalty to each other. SCENE 3. A mountain-girt plain, with a distant view of Loch Katrine. Rodrigo is joyfully acclaimed by the clansmen and welcomed by Douglas, but less ardently greeted by Elena. Her evident confusion arouses his suspicions that her heart may belong elsewhere, and these suspicions are intensified when Malcolm, coming to salute him, betrays shock and dismay when he hears of his hopes to marry Elena. Personal tensions are, however, set aside as Serano brings news that Giacomo’s forces are advancing towards them. Rodrigo calls upon a band of bards to arouse all to battle-pitch, and the clansmen, one and all, swear either to conquer or to die. At this moment a meteor flashes across the sky. Rodrigo and Douglas interpret this as a favourable omen, and, while the womenfolk retire in Elena’s wake, the clansmen march to battle. SCENE 1. A thick wood, with a cave on one side where Douglas has brought Elena for safety. Uberto enters, disguised as a peasant. The passion that he has conceived for Elena has brought him hither at his peril, but he is initially disconcerted when she scarcely remembers him, and even more abashed when he hears that she had interpreted his compliments as expressions of courtesy rather than of love. By dint of severe struggle he manages to overcome his feelings for her. Before he leaves, he declares that he once saved the King of Scots from danger and was rewarded with the gift of a ring, which he now in turn bestows upon her. He assures her that if ever she, her father or her lover should find themselves under threat, she has only to present the ring to the King to be assured of protection and pardon. The latter part of this colloquy has been observed by a third party: Rodrigo steps forward and challenges Uberto. The latter proudly declares his allegiance to the King, and taunts Rodrigo by suggesting that he has been deserted by his followers. Rodrigo promptly calls upon the clansmen, who emerge in strength from their hiding-places in the undergrowth of the wood. Despite Elena’s attempts to keep the peace, Rodrigo and Uberto go off to fight in single combat. A distraught Elena and the clansmen follow. SCENE TWO. The interior of the cave. Malcolm, in search of Elena, tells Albina that the expected battle is in heated progress, and that the royal forces have broken the ranks of the clansmen. Serano brings news that Douglas has gone to give himself up to the King, hoping to placate the royal wrath by so surrendering himself. Serano further relates that, meeting with Elena, he gave her this news, with the result that she, too, has promptly set off for the court. The misfortunes of the Scots culminate as fleeing clansmen announce the death of Rodrigo, slain in his single combat with Uberto, and the victory of the royal forces in the following battle. SCENE THREE. In the King’s palace in Stirling. Douglas, still in military dress but without sword or helmet, delivers himself up to the King – who is, as we have long realised, none other than Uberto, now to be recognised as Giacomo V. Douglas has, it transpires, participated in a tournament held to celebrate the royal victory, and has overthrown all the King’s knights. His motive, he claims, was to remind Giacomo of his past deeds of valour. But Giacomo, at least outwardly, remains unimpressed and orders him thrown into prison to await sentence. Douglas is led away. Bertram, Giacomo’s squire, announces that a woman has come bearing the royal ring and craving admission. Realising that it is Elena, Giacomo orders that she be brought in, but insists that she should not be told that he and the man she knows as Uberto are one and the same. He temporarily retires. Elena is seized with trembling to find herself in the palace where she was born: by now she feels far more at home in her humble dwelling on Loch Katrine. From off-stage she hears Uberto lamenting his loss of her, and hopes that the fact that he has not forgotten her may prove a happy omen. Upon his appearance she beseeches him to present her to the King so that she may plead for mercy for her father. A great door opens at the back of the stage, revealing the throne room. The lords and ladies of the court acclaim Giacomo, and Elena, realising that he is the centre of their attentions, at last recognises him as the King. Douglas is brought in, and Giacomo restores him to all his titles and estates. He pretends, however, to be less generously inclined towards Malcolm, whom he also holds in custody. Claiming that he condemns him to a punishment worthy of his errors, he suddenly lays severity aside, raises him up and joins his hand to that of Elena. Elena, overwhelmed by the change in her fortunes – and in the fate of those she loves – brings the opera to a suitable conclusion with expressions of gratitude and joy. 1. SZENE Auf der Bühne ist eine großartige Kulisse des schottischen Bergs Benledi zu sehen, zu dessen Fuß sich im Tal der Loch Katrine schmiegt. Bei Sonnenaufgang streifen Jäger über die Abhänge, Schäfer und Schäferinnen beginnen unten im Tal ihr Tagwerk. Auf dem See erscheint ein kleines Boot: Elena, das Fräulein vom See, taucht die Ruder ins Wasser und singt dabei ein Morgenlied, mit dem sie den neuen Tag begrüßt und das lange Ausbleiben ihres Geliebten Malcolm Groeme betrauert. Als sie ans Ufer fährt und aussteigt, tritt ein Jäger auf sie zu, der sich als Uberto, Ritter von Snowdon, ausgibt. Er erklärt, er sei von seinen Gefährten getrennt worden und habe die Orientierung verloren, und bittet sie um Hilfe. Daraufhin lädt sie ihn in ihre schlichte Behausung auf einer Insel mitten im See ein. Uberto fühlt sich sofort zu ihr hingezogen und nimmt ihre Einladung an, steigt ins Boot und fährt mit ihr zu dem Eiland. Ubertos Gefährten kommen von den Bergen herab. Ehe sie sich auf die Suche nach ihm machen und in unterschiedliche Richtungen davongehen, vereinbaren sie, dass derjenige, der ihn als erster findet, die anderen sofort verständigt. 2. SZENE Das Häuschen Elenas und ihres Vaters, Douglas d’Angus, auf der Insel. Es ist eine rustikale Hütte, an deren Wände überall Waffen hängen. Douglas, der dereinst Privatlehrer König Giacomos V. (Jakobs V.) von Schottland war, dann aber in Ungnade fiel und verbannt wurde, hat hier dank Rodrigo di Dhu (Roderick Dhu), dem mächtigen Anführer der Highlander, Unterschlupf gefunden. Serano, einer von Douglas’ Getreuen, erzählt Elenas Gefährtin Albina, dass Rodrigo an eben diesem Tage eintreffen solle. Er will seine Klanleute auf Widerstand gegen Giacomo einschwören, der die Highlands unter seine Zentralgewalt zu bringen trachtet. Albina sieht der Ankunft Rodrigos mit Bangen entgegen, weiß sie doch, dass Douglas ihm aus Dank für dessen Gastfreundschaft und Unterstützung die Hand seiner Tochter versprochen hat – aber sie weiß auch, dass Elena in Malcolm verliebt ist und Rodrigos Gefühle nicht erwidert. Elena führt Uberto ins Haus, und dieser bestaunt die an den Wänden zur Schau gestellten Waffen, denn er glaubt sie als die Waffen Douglas’ zu erkennen, den er lange Jahre nicht gesehen hat. Sein Unbehagen ist unverkennbar, und als Elena bestätigt, dass Douglas tatsächlich ihr Vater ist, drängt es ihn zu einem raschen Aufbruch. Elenas Gefährtinnen kommen herbei, um ihr den Morgengruß zu entbieten, sprechen aber auch ein unerfreuliches Thema an, denn sie erinnern sie an Rodrigos Werben. Elena reagiert betroffen, während sich in Uberto sofort Eifersucht regt. Er vermutet nicht zu Unrecht, dass sie einen Anderen als Rodrigo liebt, lässt sich aber durch die Übermacht seiner eigenen Gefühle dazu verleiten zu glauben, dieser Andere sei er selbst. Mit der den Highlander eigenen Gastfreundschaft bietet sie ihm Bier zu trinken an und willigt sofort ein, als er erklärt, er wolle zu seinen Begleitern zurückkehren. Allerdings lässt sie sich von ihm nicht die Hand küssen – ein solcher Brauch sei in den Highlands unbekannt, erklärt sie ihm. Sie zieht sich in ihre Gemächer zurück, während Albina Uberto ans Festland rudert. Kaum ist die Bühne leer, tritt Malcolm auf; nach mehrmonatiger Abwesenheit ist er schließlich heimgekehrt. Sein Glück wird allerdings getrübt durch die Befürchtung, Elena könnte ihm doch noch entrissen werden, und erleichtert beobachtet er, mit welcher Zurückhaltung sie ihren Vater begrüßt, der ebenfalls in just diesem Augenblick zurückkehrt, Ausflüchte macht und jedes Gespräch über eine Heirat ablehnt mit der Begründung, in diesen unsicheren Zeiten sei ein derartiger Gedanke unpassend. Douglas ist Widerspruch nicht gewohnt und weist seine Tochter streng zurecht, aber als in der Ferne Trompetenfanfaren erklingen, geht er hinaus, um Rodrigo zu empfangen. Nun tritt Malcolm vor und umarmt Elena, und die beiden beteuern sich gegenseitig ihre Liebe und Treue. 3. SZENE Eine Hochebene, in der Ferne ist Loch Katrine zu sehen. Rodrigo wird von den Klanmännern freudig begrüßt und von Douglas willkommen geheißen, doch Elena empfängt ihn weniger herzlich. Ihre unverkennbare Befangenheit lässt ihn den Verdacht schöpfen, sie habe ihr Herz einem anderen Mann geschenkt, und sein Verdacht wird erhärtet, als Malcolm, der ihn nun ebenfalls begrüßt, Entsetzen und Bestürzung an den Tag legt, als er von dessen Absicht hört, Elena zu heiraten. Doch diese persönlichen Spannungen werden rasch beiseite gelegt, als Serano die Nachricht überbringt, dass Giacomos Truppen im Anmarsch sind. Rodrigo bittet eine Gruppe von Barden, die Männer auf die bevorstehende Schlacht einzustimmen, und die Klanmänner schwören bis auf den letzten Mann, zu siegen oder zu sterben. In dem Augenblick fliegt ein Meteor über den Himmel. Rodrigo und Douglas deuten dies als günstiges Omen, und während die Frauen sich mit Elena zurückziehen, gehen die Klanmänner in die Schlacht. 1. SZENE Dichter Wald mit einer Höhle, in die Elena von Douglas in Sicherheit gebracht wurde. Uberto tritt auf, als Bauer verkleidet. Von seiner Leidenschaft zu Elena getrieben, hat er allen Gefahren getrotzt, um sie hier aufzusuchen, doch zu seiner Bestürzung muss er feststellen, dass sie sich kaum seiner erinnert, und noch größer ist seine Bestürzung, als er erfährt, dass sie seine Komplimente als Ausdruck der Höflichkeit und nicht als Worte der Liebe gedeutet hat. Mit aller Macht gelingt es ihm, seine Gefühle für sie zu überwinden. Bevor er aufbricht, erzählt er ihr, dass er früher einmal den König von Schottland aus einer Gefahr errettet habe und zum Dank einen Ring erhielt, den er nun ihr schenkt. Sollte sie, ihr Vater oder ihr Geliebter je in Gefahr geraten, so versichert er ihr, brauche sie lediglich dem König diesen Ring zu präsentieren, dann seien ihr Schutz und Vergebung gewiss. Ein anderer Mann hat den zweiten Teil dieses Gesprächs mitangehört: Rodrigo, der nun vortritt und Uberto zur Rede stellt. Dieser schwört stolz seine Treue zum König und stachelt Rodrigo mit den Worten auf, dieser sei wohl von seinen Gefolgsleuten im Stich gelassen worden. Daraufhin ruft Rodrigo sofort seine Männer herbei, die aus ihren Verstecken im Dickicht stürmen. Trotz Elenas Bemühungen, Frieden zu stiften, gehen Rodrigo und Uberto davon, um sich im Zweikampf zu messen. Elena und die Klanmänner folgen ihnen bekümmert. 2. SZENE Im Inneren der Höhle. Malcolm, der nach Elena sucht, berichtet Albina, dass die Schlacht in vollem Gange ist und dass die königstreuen Truppen den Widerstand der Klanmänner gebrochen haben. Dann überbringt Serano die Nachricht, dass Douglas sich auf den Weg gemacht habe, um sich dem König zu ergeben in der Hoffnung, damit dessen Zorn zu beschwichtigen. Des weiteren berichtet er, dass er auf Elena getroffen sei und ihr diese Nachricht erzählt habe, woraufhin auch sie sofort zum Hof aufgebrochen sei. Als verhängnisvoll für die Moral der Highlander erweist sich aber, als fliehende Klanmänner den Tod Rodrigos melden, der im Zweikampf mit Uberto gefallen sei, und berichten, dass die königlichen Truppen in der darauf folgenden Schlacht den Sieg davongetragen haben. 3. SZENE Der Königspalast in Stirling. Douglas, noch in Kampfuniform, doch ohne Schwert und Helm, ergibt sich dem König – der, wie wir schon längst erahnt haben, kein anderer als Uberto ist und jetzt als Giacomo V. auftritt. Douglas, so erfahren wir, hat an einem Turnier teilgenommen, das zur Feier des Siegs der königlichen Truppen abgehalten wurde, und alle Ritter des Königs bezwungen hat. Damit, so erklärt er, wolle er Giacomo an seine früheren heldenhaften Taten erinnern. Doch Giacomo zeigt sich, zumindest äußerlich, wenig beeindruckt und befiehlt, Douglas ins Gefängnis zu werfen, um seiner Verurteilung entgegenzusehen. Er wird abgeführt. Giacomos Knappe verkündet, dass eine Frau eingetroffen sei, die den königlichen Ring präsentiert habe und vorgelassen zu werden wünsche. Giacomo weiß, dass es sich um Elena handelt, und ordnet an, sie vorzulassen, aber auch, dass ihr nicht gesagt werden dürfe, dass er und der Mann, den sie als Uberto kennt, ein und derselbe sind. Er zieht sich zurück. Mit Unbehagen sieht Elena sich in dem Palast um, in dem sie dereinst zur Welt kam; mittlerweile fühlt sie sich in ihrem bescheidenen Zuhause im Loch Katrine weitaus heimischer als hier. Von hinter den Kulissen hört sie Uberto über ihren Verlust klagen und hofft, die Tatsache, dass er sie nicht vergessen hat, möge ein glückliches Omen sein. Als er vor sie tritt, beschwört sie ihn, sie zum König zu führen, damit sie ihn um Gnade für ihren Vater anflehen könne. Hinten auf der Bühne öffnet sich eine große Tür zum Thronsaal. Die Damen und Herren des Hofstaats jubeln Giacomo zu, und als Elena erkennt, dass ihm diese Glückwünsche gelten, wird ihr schließlich klar, dass er selbst der König ist. Douglas wird hereingeführt, und Giacomo setzt ihn wieder in all seine Titel und Güter ein. Allerdings gibt er vor, Malcolm, der ebenfalls im Gefängnis liegt, weniger gewogen zu sein, und behauptet, er wolle ihn für all sein Fehlverhalten bestrafen. Doch unvermittelt legt er alle Strenge ab, richtet Malcolm auf und legt dessen Hände in Elenas. Überwältigt von dem Wandel ihres Glücks – und dem Glück aller, die sie liebt –, führt Elena die Oper mit einem Ausdruck von Dankbarkeit und Freude dem Ende entgegen. SCENA 1. Un’elaborata scenografia riproduce le alture scozzesi di Benledi, alle cui pendici si trova il Lago Katrine. Spunta l’alba e alcuni cacciatori attraversano la valle, mentre pastori e pastorelle si dirigono al lavoro, come ogni giorno. Sul lago compare un piccolo battello: ai remi si trova Elena, la Donna del Lago, e con il suo canto saluta l’alba, rammaricandosi allo stesso tempo per la prolungata assenza dell’uomo che ama, Malcolm Groeme. Quando raggiunge la sponda e sbarca, le si avvicina un cacciatore; ben presto ci rendiamo conto che si tratta di Uberto, Cavaliere di Snowdon. L’uomo dichiara di essersi smarrito dopo aver perso di vista i compagni e le chiede aiuto; lei gli offre ospitalità nella sua povera capanna su un’isola al centro del lago. Uberto, che si sente spontaneamente attratto da lei, accetta l’invito, entra nel battello e attraversa il lago con lei. Alcuni cacciatori, compagni di Uberto, scendono dalle colline per cercarlo e si disperdono in varie direzioni, ma prima si accordano: il primo che lo vedrà dovrà comunicarlo agli altri. SCENA 2. L’abitazione di Elena e di suo padre, Douglas d’Angus, sull’isola. Si tratta di una capanna contadina, con le pareti ricoperte di armi. Douglas, ex tutore di re Giacomo V di Scozia, ma ormai esiliato, in disgrazia, è stato accolto qui da Rodrigo di Dhu, formidabile capo degli Alpini (gli Highlander). Serano, uno dei seguaci di Douglas, comunica ad Albina, dama di compagnia di Elena, che Rodrigo è atteso proprio quel giorno. Intende riunire i componenti del suo clan per combattere il tentativo di Giacomo di portare gli Highland sotto il suo controllo centralizzato. Albina attende con qualche preoccupazione l’arrivo di Rodrigo: sa che Douglas, riconoscente dell’ospitalità e della protezione ricevute, gli ha promesso la mano di Elena. Ma sa anche che Elena, già innamorata di Malcolm, non può ricambiare l’amore di Rodrigo. Uberto entra, accompagnato da Elena, ed è sorpreso nel vedere le pareti ricoperte di armi, soprattutto perché le riconosce: appartengono a Douglas, che non vede da tempo. Questo lo mette visibilmente a disagio e, quando Elena conferma che Douglas è suo padre, si fa sempre più ansioso di andarsene. Arrivano le compagne di Elena per darle il buongiorno, ma quando le ricordano l’amore di Rodrigo, lei reagisce con sbigottimento. Uberto invece tradisce segni di gelosia: ha indovinato che Elena è innamorata di un altro ma, ingannato dalla forza dei propri sentimenti, conclude che si tratta di lui. Elena gli offre una tazza di cervogia nel rispetto delle norme di ospitalità delle Highland e accetta di esaudire il suo desiderio di andare a raggiungere i compagni. Rifiuta però di lasciarsi baciare la mano e gli dice che si tratta di costumi inconsueti nella regione. Si ritira nelle sue stanze, mentre Albina riaccompagna Uberto sulla terraferma. La scena rimane vuota per un attimo e poi entra Malcolm, di ritorno dopo un’assenza di diversi mesi. La sua felicità è minata dal timore che qualcuno gli possa portare via Elena ed è sollevato quando, in disparte, osservando il modo in cui la donna saluta sua padre, che rientra anche lui in questo momento, nota che lei cerca di sviare ogni accenno al matrimonio: si tratta di idee premature, data l’incertezza della situazione presente. Douglas, che non è abituato a essere contraddetto, la rimprovera duramente ma poi, sentendo alcune trombe squillare in lontananza, va ad accogliere Rodrigo. Malcolm si fa avanti per abbracciare Elena ed entrambi si rinnovano dichiarazioni di amore e fedeltà reciproca. SCENA 3. Una pianura circondata da monti; in lontananza si può vedere il lago. Rodrigo viene acclamato allegramente dagli uomini del clan e accolto da Douglas; Elena lo saluta con meno entusiasmo, e la sua evidente confusione è sufficiente a far sorgere in lui il sospetto che il suo cuore appartenga a qualcun altro. Il dubbio viene confermato quando Malcolm, che si avvicina a salutarlo, tradisce sconcerto e delusione quando sente parlare delle sue speranze di sposare Elena. I sentimenti personali vengono tuttavia messi da parte quando Serano arriva per annunciare la minacciosa avanzata dell’esercito di Giacomo. Rodrigo convoca un gruppo di bardi per convocare tutti alla lotta e gli uomini del clan all’unisono giurano di vincere o morire. A questo punto il cielo è attraversato dal passaggio di una meteora. Rodrigo e Douglas lo interpretano come un presagio favorevole e, mentre le donne si ritirano seguendo Elena, gli uomini si dirigono verso il campo di battaglia. SCENA 1. Un fitto bosco, con una caverna da un lato, dove Douglas ha portato Elena per tenerla al sicuro. Entra Uberto, travestito da contadino. La sua passione per Elena lo ha spinto a sfidare ogni pericolo per arrivare qui, ma inizialmente rimane sconcertato perché la donna si ricorda a fatica di lui ed è ancora più imbarazzato quando lei gli dichiara di aver interpretato i suoi complimenti come espressioni di cortesia e non d’amore. Con un grande sforzo riesce a far tacere i suoi sentimenti per lei e, prima di allontanarsi, le consegna un anello. Racconta che gli è stato donato dal re degli Scozzesi per ringraziarlo di averlo salvato e le dice che, se mai lei, suo padre o il suo innamorato dovessero sentirsi minacciati, basterà consegnare l’anello al re per ottenere perdono e protezione. Quest’ultima parte del colloquio è stata ascoltata da un’altra persona: Rodrigo si fa avanti e sfida Uberto, il quale fieramente dichiara la propria fedeltà al Re e stuzzica Rodrigo, insinuando che è stato abbandonato dai suoi seguaci. Rodrigo convoca immediatamente gli uomini del clan, che emergono dai loro nascondigli nel sottobosco. Nonostante i tentativi di Elena di mantenere la pace, Rodrigo e Uberto si allontanano per affrontarsi a duello, seguiti da Elena, disperata, e dagli uomini del clan. SCENA SECONDA. L’interno della caverna. Malcolm, in cerca di Elena, racconta ad Albina che la battaglia infuria e che l’esercito del re è riuscito a dividere le forze del clan. Serano porta la notizia che Douglas è andato a consegnarsi al Re, nella speranza di placare l’ira del sovrano, e aggiunge che, avendo incontrato Elena, le ha comunicato la notizia e anche lei si è subito incamminata verso la corte. Le sventure degli Scozzesi non sono però finite: alcuni uomini del clan in fuga annunciano la morte di Rodrigo, ucciso in duello da Uberto, e la vittoria dell’esercito reale nello scontro successivo. SCENA TERZA. Il palazzo del Re a Stirling. Douglas, ancora in abbigliamento militare, ma senza spada o elmo, si consegna al Re che, come avevamo già indovinato, altri non è che Uberto, ma adesso si rivela come Giacomo V. Veniamo a sapere che Douglas ha partecipato a un torneo tenuto per celebrare la vittoria del re e ha sconfitto tutti i suoi cavalieri. Douglas sostiene di aver agito così per ricordare al re le sue passate gesta di valore. Ma Giacomo rimane apparentemente impassibile e ordina che il cavaliere sia gettato in prigione in attesa della sentenza. Douglas è condotto via. Bertram, servitore di Giacomo, annuncia che è arrivata una donna con l’anello del re e chiede di essere ricevuta. Giacomo capisce che si tratta di Elena e ordina che venga fatta entrare, ma chiede che non le venga rivelata la sua vera identità e si ritira. Elena viene colta da un tremito nel ritrovarsi nel palazzo dove è nata: ormai si sente molto più a proprio agio nell’umile casa del lago Katrine. Da una stanza fuori scena le arriva il canto di Uberto, che rimpiange di averla perduta e non riesce a dimenticarla. Non appena l’uomo compare, lo supplica di presentarla al Re per poterlo supplicare a favore del padre. In fondo alla scena si apre una grande porta che conduce alla sala del trono. I signori e le dame della corte acclamano Giacomo; rendendosi conto che tutte le attenzioni sono dirette a lui, Elena finalmente capisce di trovarsi davanti al Re. Viene condotto Douglas e Giacomo gli restituisce i titoli e le terre, ma finge di non essere altrettanto bendisposto nei confronti di Malcolm, anche lui prigioniero. Dichiarando che lo condanna a una pena degna dei suoi errori, improvvisamente abbandona ogni severità, lo fa alzare e unisce la sua mano a quella di Elena. Sopraffatta dall’improvviso cambiamento della propria sorte e del destino delle persone a lei più care, Elena conclude in bellezza l’opera esprimendo gratitudine e gioia. SCÈNE 1. Un décor recherché évoquant l’Écosse et représentant le mont Benledi, avec en contrebas, au creux d’une vallée, le Loch Katrine. À la pointe du jour, on aperçoit des chasseurs sur les pentes, tandis que bergers et bergères vont, comme chaque jour, surveiller les troupeaux dans la vallée. Une petite yole apparaît sur le loch : Elena, la dame du lac, est aux avirons et chante une aubade où elle salue l’aube tout en lamentant l’absence prolongée de son bien-aimé, Malcolm Groeme. Au moment où elle atteint le rivage pour débarquer, un chasseur l’interpelle. C’est Uberto, chevalier de Snowdon, qui s’est égaré après avoir été séparé de ses compagnons et demande son aide à Elena. Celle-ci lui offre l’hospitalité dans le modeste logis qu’elle occupe sur une île au milieu du loch. Immédiatement sous son charme, Uberto accepte l’invitation, monte dans la yole et traverse le lac avec elle. Les chasseurs abandonnent les hauteurs à la recherche d’Uberto. Chacun prend une direction différente, étant entendu que le premier à l’apercevoir fera signe à ses compagnons. SCÈNE 2. Le logis d’Elena et de son père, Douglas d’Angus, au milieu du lac. Des armes en ornent les murs. Douglas est l’ancien précepteur du roi Giacomo V (Jacques V d’Écosse). Tombé en disgrâce et banni, il a trouvé refuge sur l’île grâce à Rodrigo di Dhu (Roderick Dhu), le redoutable chef des Highlanders. Serano, qui est au service de Douglas, informe Albina, la servante d’Elena, que Rodrigo est attendu le jour même. Sa visite a pour but de rassembler les hommes de son clan pour résister au roi qui tente de prendre le contrôle des Highlands. Albina attend l’arrivée de Rodrigo avec quelque appréhension. Elle sait que Douglas lui a accordé la main d’Elena en mariage afin de le remercier de son hospitalité et de sa protection. Elle sait aussi qu’Elena, déjà éprise de Malcolm, est incapable d’aimer Rodrigo en retour. Elena entre accompagnée d’Uberto. Il est surpris à la vue des armes qui ornent les murs : il est certain, en effet, de les reconnaître comme celles de Douglas, qu’il n’a pas vu depuis si longtemps. Manifestement mal à l’aise, il est encore plus pressé de partir quand Elena lui confirme que Douglas est son père. Des femmes du clan venues saluer Elena lui rappellent, par malheur, la demande en mariage de Rodrigo : elle trahit son désarroi tandis qu’Uberto manifeste des signes de jalousie. Il devine bien qu’elle aime quelqu’un d’autre que Rodrigo, mais, aveuglé par ses propres sentiments, il croit à tort que c’est lui qu’elle aime. Elena lui offre un bock de bière comme il est coutume de le faire dans les Highlands avant de le laisser rejoindre ses compagnons. Elle ne lui permet pas, toutefois, de lui baiser la main, car cela ne se fait dans les Highlands. Elle se retire tandis qu’Albina conduit Uberto jusqu’au rivage. À peine disparaissent-ils de la scène que Malcolm fait son entrée après une absence de plusieurs mois. Son bonheur est assombri par la crainte de pouvoir encore perdre Elena. C’est avec soulagement que, sans trahir sa présence, il observe la manière dont elle salue son père venu à cet instant la rejoindre : elle essaie, en effet, de gagner du temps et d’éviter le sujet de son mariage en prétendant qu’il est prématuré d’en parler étant donné la situation politique. Douglas, peu habitué à voir ses vœux contrariés, lui adresse de vifs reproches puis, au son d’une lointaine fanfare, part à la rencontre de Rodrigo. Malcolm s’avance pour embrasser Elena et ils se jurent à nouveau amour et fidélité. SCÈNE 3. Une plaine entourée de montagnes avec, au loin, le Loch Katrine. Sous les acclamations des membres de son clan, Rodrigo est accueilli chaleureusement par Douglas, mais avec moins d’ardeur par Elena, manifestement embarrassée. Il en conçoit le soupçon qu’elle aime quelqu’un d’autre, opinion qui se renforce lorsque Malcolm, venu le saluer, trahit sa surprise et son désarroi en apprenant que Rodrigo entend épouser Elena. Les rivalités personnelles s’estompent pourtant lorsque Serano vient annoncer que l’armée royale marche sur eux. Rodrigo fait appel aux bardes pour donner du courage à ses troupes et tous les membres du clan, d’une seule voix, jurent de vaincre ou de mourir. À ce moment précis, une étoile filante apparaît dans le ciel. Rodrigo et Douglas y voient un présage favorable et, tandis que les femmes se retirent à la suite d’Elena, les hommes du clan partent au combat. SCÈNE 1. Un bois épais flanqué d’une grotte où Douglas a mis Elena en sécurité. Uberto entre, déguisé en paysan. C’est sa passion pour Elena qui l’a conduit ici au péril de sa vie. Or elle se souvient à peine de lui. L’émotion d’Uberto se fait plus intense encore lorsqu’elle ajoute qu’elle a pris ses compliments pour une marque de courtoisie et non d’amour. Au prix d’un immense effort, il parvient à surmonter ses sentiments et, avant de prendre congé, remet à la jeune femme un anneau, en lui expliquant qu’il l’a reçu du roi d’Écosse à qui il a sauvé la vie. Si un jour elle, son père ou son amant se trouvaient en danger, il lui suffirait de présenter cet anneau au roi pour être aussitôt assurée de sa protection et de son pardon. Ces dernières déclarations ont eu pour témoin Rodrigo, qui s’avance et provoque Uberto en duel. Celui-ci se targue d’être fidèle au roi et raille Rodrigo abandonné, dit-il, par ses partisans. Rodrigo appelle immédiatement ses hommes qui surgissent en force des fourrés. Malgré les tentatives d’apaisement d’Elena, Rodrigo et Uberto s’éloignent pour s’affronter en duel. Elena désemparée et le reste du clan les suivent. SCÈNE 2. L’intérieur de la grotte. Malcolm, à la recherche d’Elena, raconte à Albina que la bataille fait rage et que l’armée du roi a ouvert une brèche dans les rangs des Écossais. Serano vient leur annoncer que Douglas est allé se rendre au roi, dans l’espoir de calmer son courroux. Et il ajoute qu’en apprenant la nouvelle, Elena s’est immédiatement mise en route pour la cour. Les malheurs des Écossais sont à leur comble lorsque les troupes en fuite annoncent la mort de Rodrigo, tué en combat singulier par Uberto, et la victoire de l’armée royale au cours de la bataille qui a suivi. SCÈNE 3. Le palais du roi à Stirling. Douglas, encore en uniforme, mais sans épée ni casque, se rend au roi Jacques – lequel n’est nul autre qu’Uberto, comme le spectateur l’a deviné depuis longtemps et en est sûr maintenant. Douglas a participé, paraît-il, à un tournoi organisé en l’honneur de la victoire et désarçonné tous les chevaliers du roi. Il l’a fait, prétend-il, pour rappeler au roi ses actes de bravoure passés. S’il est impressionné, le roi n’en laisse rien paraître et ordonne qu’on le jette en prison en attendant sa condamnation. Douglas est emmené. Bertram, l’écuyer du roi, annonce l’arrivée d’une femme qui porte l’anneau royal et demande instamment une audience. Comprenant qu’il s’agit d’Elena, le roi ordonne qu’on la fasse entrer, mais insiste pour qu’on lui cache que le roi et celui qu’elle appelle Uberto sont la même personne. Il quitte la scène momentanément. Elena tremble d’émotion à l’idée de se retrouver dans le palais où elle est née : elle se sent désormais plus à l’aise dans l’humble logis au milieu du Loch Katrine. Elle entend la voix d’Uberto – en coulisses – qui se lamente de l’avoir perdue et, constatant que cette fois elle ne l’a pas oublié, y voit un heureux présage. Lorsqu’il apparaît, elle le supplie de la conduire auprès du roi de sorte qu’elle puisse plaider la cause de son père. La grande porte qui s’ouvre alors à l’arrière de la scène donne sur la salle du trône. Les seigneurs et les dames de la cour acclament Giacomo, et Elena, comprenant qu’il est le centre d’attention, reconnaît enfin en lui le roi. Il fait comparaître Douglas devant lui et lui rend tous ses titres et ses terres. Il prétend, toutefois, être moins bien disposé à l’égard de Malcolm, lui aussi son prisonnier. Après avoir d’abord déclaré qu’il entend le condamner à une peine à la mesure de ses erreurs, il abandonne soudain toute gravité, le relève et place sa main dans celle d’Elena. Elena, bouleversée par ce changement de fortune pour elle et ceux qu’elle aime mène l’opéra à sa juste conclusion en chantant sa gratitude et sa joie.